Patented Microbubble Formulation Eye-Scrub’s patented formulation creates a unique microbubble lather that 's perfect for eye makeup removal or daily eyelid hygiene. Rub the closed Eye-Scrub pouch to develop lather, then open. 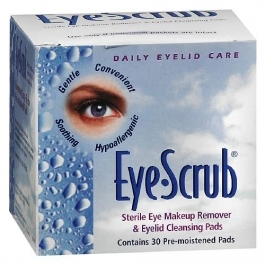 Close eye, then sweep Eye-Scrub pad gently across eyelid several times. Using a fresh pad, repeat process on other eye. Discontinue use and consult your eye healthcare professional, if you experience excessive itching, redness, swelling or persistent irritation. See enclosed consumer brochure for more important information. Use only if individual packets are intact.